It’s not true that the government shutdown, concluded over the weekend after 35 days of shutdown, accomplished “nothing.” President Trump did not score a policy victory on the issue that led to the shutdown. The continuing resolution that is to run for three weeks, as signed by the president, does not include a dime of funding for a wall along the U.S.-Mexican border. The Mexican standoff over the Mexican border wall did, however, accomplish something important. It revealed just how radical the Democrats have become on the issue of immigration. In the run-up to the 2020 election elections, they have been smoked out. That’s not nothing. The telling fact, what will become clear over the next two years, was Democratic radicalism that caused the shutdown in the first place. President Trump did not ask for much, just $5.7 billion to begin construction of a barrier along porous sections of the border. The sum of $5.7 billion seems like a lot to mere mortals, but it was no more than a rounding error against the largesse of the federal budget. Not long ago, Democrats like Chuck Schumer and Hillary Clinton, happily voted to build barriers along the border. The president’s request can only be judged unreasonable by a campaign consultant looking for an issue to exploit. But something happened on the way to striking a budget deal. When faced with President Trump’s demand for an appropriation for wall construction, Speaker of the House Nancy Pelosi, the party theologian, said building the wall would be an “immorality.” The Democrats, figuring that being against borders and national sovereignty, the building blocks of the nation state, would be winning politics, boasted they would never spend a penny on maintaining the border. This was breathtakingly radical, and led directly to the shutdown when the president rightly declined to go along. The shutdown did inflict damage. Eight hundred thousand federal workers went weeks without pay, though they will be paid for time missed. Less fortunate contract workers, like those who clean the restrooms at the Smithsonian Institution, for example, won’t be. During the shutdown, air traffic control and the TSA were hobbled. National parks were closed. Tax rebate checks will be delayed, given the backlog of work that piled up during the shutdown. It’s clear to everyone why the president felt compelled to end the shutdown, even at the cost of nothing for the wall. In the face of Democratic intransigence, he took the responsible position. He couldn’t negotiate a compromise with Democrats who said they would never compromise. There are two reasons, neither good. The first is nakedly political. The central promise of Mr. Trump’s 2016 campaign was building the wall. Denying him the ability to do that would damage his re-election campaign by making the wall a broken promise. The president’s own political miscalculation played a part here. He should have asked for funding for the wall when the Republicans controlled the House instead of waiting until Mrs. Pelosi took over. The other reason is even more cynical. Democrats claim to oppose the wall because “it doesn’t work.” This is nonsense. The experience of San Diego, Israel and other places demonstrates that walls work well. If walls are not effective, why are they, as Mrs. Pelosi insists, “immoral?” In fact, the actual reason Democrats oppose the border barrier is precisely because walls do work. With declining support from white and older Americans, the Democrats have concluded that their future lies in importing a new electorate from south of the border. A wall would prevent that. The continuing resolution runs until Feb. 15, when there could very well be another shutdown. The Democrats are unlikely to capitulate. Neither is the president. Mr. Trump has floated another idea to get his wall funding, declaring a national emergency and order the wall to be built. The president has the legal authority to do so, though this option makes a lot of us uneasy. Declaring a national emergency in the face of political intransigence would set a dangerous precedent. The Democrats, by refusing to protect the country’s sovereignty for nakedly political ends, are setting a dangerous precedent themselves. Yea, that sceme is importing illegal invaders to keep them voted into power..
a. He didn’t believe in it. b. He, along with McConnell, thought it was a non-starter for the centrists and the moderates in the party. So, if we want to blame POTUS for not getting funding while he had control, it lies with the party pundits and not the President! Now if we look at the current status, the Dems as you so adequately describe, are not going to negotiate or compromise, solely because it is something Trump wants and promised! 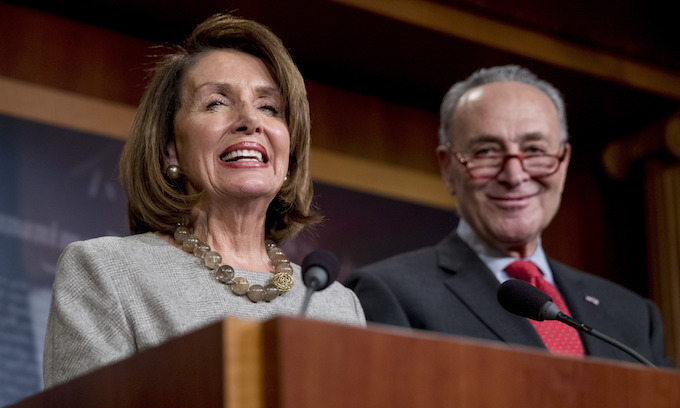 They believe that they can stymie the progress on border control, not forfeit any votes in 2020 in doing so and possibly garner 100’s more from the immigrants that are allowed to flow into our country unabated. Your point as well. This is where the whole political landscape gets mired in unproductive fighting and becomes nauseating to say the least. Because the Dems want to flex their muscle and show their liberal base they can stop the wall, they will stick their proverbial feet in concrete and head in the sand for solely self-serving political gain. When the safety and the sovereignty of this country is at stake. Maybe time to check out of this scene and find a nice quiet out of the way, safe place where no one else or very few want to be!! So then why do we need the GOP in congress, if all they are going to do is cave in and let the dems do what ever anyway? Betting time: I bet that the 9th circuit court of appeals will be telling Trump that he cannot build the wall under the guise of a National Emergency. Government is stagnant as our politicians are trying to outjockey each other for control! Somewhere this needs to change. 1: Clinton- his operatives Begala and Carville started the “Scorched Earth” policy- no negotiating, and its all or nothing. The immigration issue smoked the Dem’s in 94′ too. But Newt and the new majority Pub’s kept the Dem course on immigration. The Pub’s used conservative speak for not supporting what their campaign promised. President Trump had to fight Speaker Ryan and the Senate Rinos almost as hard as he will Pelosi and Schumer–that’s why the wall was not funded before the Dems took over the House. Trump was smart to start educating the general public on how the media misreports the problems of not having a wall, the $114 Billion we spend annually while Dems argue $5 Billion is too much to spend on a wall, and that the Dems did not care about the 800,000 unpaid Fed employees because they voted against a GOP bill that would have paid them during the shutdown. We have to educate before we can eradicate the Swamp. Especially with the media omitting real news and pushing out and out lies as news to try to get Trump impeached. For the dem voter, it seems no ammount of ‘education’ will “WAKE THEM UP”. They’ve just been brainwashed too much by the liberal indoctrination centers (i mean schools)..
Trump doesn’t need to declare a national emergency that the 9th circus will find a way to block. He can just divert funds from the DOD and have military build the wall for National Security. It would be well within his authority and harder for a liberal judge to block. We’re talking about foregoing an expensive jet or ship to do it. You can bet a judge will still TRY..
despicable Democrats Pelosi, and Schumer. I WANT the wall to be built, and I believe that it WILL be built. We NEED this measure of security, in addition to more border agents, and more technology. Frankly, I am FURIOUS with those 2 ignoramuses, Pelosi, and Schumer, who are apparently the BEST, that this pathetic Democrat Party has to offer ! its not just those 2 though. ITS THE entire commucrat party and all the bloody RINOS in office.